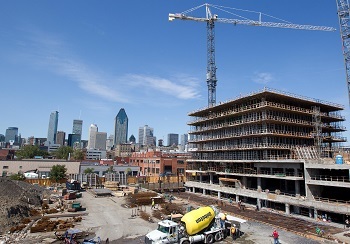 One of Canada’s largest markets is leading the decline in national housing starts, largely due to earlier construction booms, according to a report by the Canada Mortgage and Housing Corp. In Vancouver, October housing starts fell eight percent to 14,443, compared to the same period a year ago. Nationally, seasonally adjusted housing starts in October fell almost 10 per cent to 183,604, compared to 201,329 starts in the year-ago period. Conversely, construction in Toronto continues to be bullish, as evidenced by a whopping 70 per cent rise in new housing starts over September, to 25,611 starts in October. The seasonally adjusted urban starts decreased 10 per cent year-over-year, to 164,683 in October. From the month prior, starts fell seven per cent. In its report, CMHC attributed the decline to multiple urban starts, which fell to 98,673 in October, led by British Columbia, Quebec and Atlantic Canada. Single-detached urban starts increased to 66,010 units.